If you’re an ocean surfer – or would like to become one, a skateboard surf adapter can make your existing skateboard, longboard, or cruiser ride a lot like a surfboard on a wave. Surf skating is a skateboarding style that involves surf-style carving and surf-like maneuvers on land. Skateboard surf adapters like Waterborne and Yow let you get into the world of surf skating by re-using your favorite skateboard/longboard deck and trucks, turning them into a tight-carving surf skate without having to invest in a whole new truck system – as is the case with traditional surf skate trucks like Carver or Swelltech. The Waterborne Surf Adapter (Amazon) is a turning mechanism that fits in between your deck and truck to make your skateboard or longboard ride a lot like a surfboard. It makes your board 3 to 4 times sharper turning, yet without losing the specific characteristics and riding feel of your original setup. With a price of around $70, it’s a much cheaper option than a surf skate complete or even a set of surf trucks (e.g. Carver). The Waterborne surf adapter dramatically decreases your skateboard’s turning radius and allows you to pump the board on a flat surface. It will make your existing setup a lot more pumpable, carvy, and slidable, allowing you to perform surf-style slides and cutbacks with much more control. You mount the Waterborne adapter on your front truck to turn your skateboard/longboard into a surf skate. The extra tight carving behavior you get from the adapter lets you ride your skateboard like a surfboard on land and perform surf-style turns and maneuvers. In addition to the skateboard surf adapter on the front truck, you can get the Waterborne Rail Adapter for your rear truck (sells separately) to make your skateboard, longboard or cruiser even carvier and surfier. The Rail Adapter adds extra lean to your rear truck, which helps keep all 4 wheels on the ground during tight carves. The rear truck hence leans as much as the front, making the back of your skateboard behave more like a surfboard’s tail with the fins. Rail-to-rail transitions also smoother like when surfing a wave. Besides turning your regular skateboard or longboard into a land surfboard, using the Surf and Rail Adapters together also gives you more stability at speed as the added lean on the rear trucks results in less turning and more grip, resulting in less speed wobbles when riding fast. The skateboard Surf and Rail adapters also give you added suspension and a dampened ride on any kind of terrain thanks to the rubber bushings they use. Both adapters use soft traditional urethane bushings at their core, instead of metal springs like other surf trucks, for bringing back the turning arm toward the center. Suspension is also reinforced by the elasticity of the aluminum alloy used in both front and rear skateboard surf Adapters. The Waterborne Surf Adapter works pretty much with any skateboard, longboard, or cruiser. 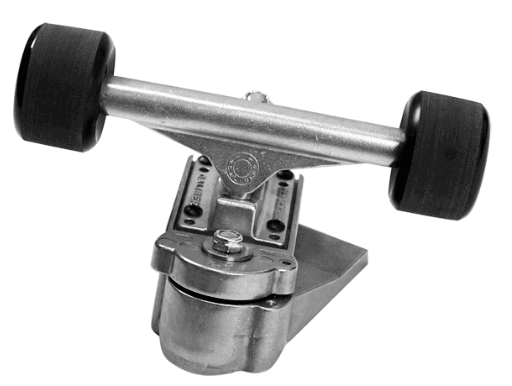 However, the surf-like type of carving the Adapter enables best works with grippy wheels (softer wheels with enough contact patch) and looser trucks – riders often loosen their trucks after installing the Surf Adapter. The Surf and Rail Adapters use the new school mount hole pattern and hence can be fitted on decks with either old or new school patterns. The Surf Adapter is a robust mechanical part, tested to support very radical surf skate moves. Hard snapbacks and surf slides put a lot of pressure on the skateboard surf adapter, particularly with a heavier rider. Waterborne’s adapter can withstand up to 1500 lbs of pressure, with is way above normal range. Riders generally agree the skateboard surf adapter feels very sturdy and lasts a long time. On the flip side, it’s quite heavy and adds weight to the front truck, which initially requires some getting used to in turns. As mentioned, while the springs of most spring-powered surf skate truck systems eventually snap and need replacement, the bushings-based Waterborne adapter has great durability. Installing the Waterborne skateboard surf adapter is straightforward. You’ll need 4 hex head bolts and nuts, 4 short Phillips bolts and nuts, and a block riser – all these come with the surf adapter. Bolt the surf adapter (now paired to the front truck) to the deck using the short Phillips screws. Tighten the bolts as well as the larger screw holding the turning arm in the front. Adjust the tightness of your front truck as desired. The Waterborne adapter is much more stable at speed than Swelltech’s 360º spinning V-truck (that powers Swelltech’s surfskate completes like the Jamie O’Brien), and thus better-suited for skateboard transportation. Although more stable at speed, some riders find the Waterborne looser than the Swelltech, which is great if your goal is surf training. The Waterborne lets you keep the feel of your existing skateboard or longboard setup, while other surf skate systems completely change it – since you need to replace the trucks and/or deck. 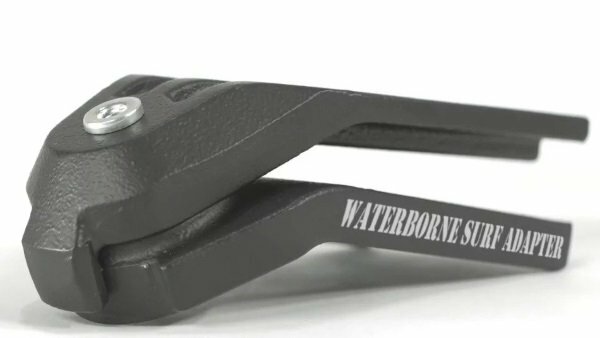 To recap, the Waterborne surf adapter is a capable mechanical piece that effectively turns any skateboard or longboard into a sharp-turning surf skate. Check out its reviews and price on Amazon. The Yow Truck System (Amazon) is another skateboard surf adapter that turns your regular skateboard or longboard into a tight carving, pumpable, and slideable machine for radical surf-style riding on land. YOW stands for “Your Own Wave”! Yow is growing in popularity in Europe. The truck system is 100% designed and built in the Spanish Basque Country by HLC and manufactured in Europe’s largest skateboard factory. 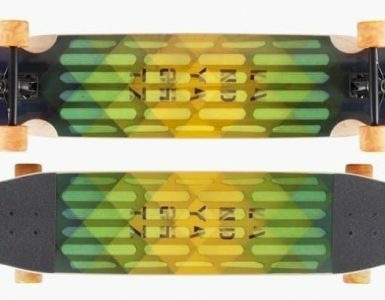 After years of development, Yow’s engineers have created their unique patented surf skate system, which allows you to really get a surfing feeling when skating. Unlike Waterborne, the Yow surf skateboard adapter system using the torsion of an internal spring to make your skateboard/longboard turn very tight. Similar to Waterborne, with a Yow-enhanced setup you get the ability to make very fluid surf-like turns and to easily propel yourself through pumping on flat ground or even uphill. The Yow surf adapter comes in two different versions, the S4 and the S5. The S4 is powered by a 4mm spring which offers relatively light resistance when pulling the mechanism back to the center in turns. As a result, it’s best-suited for performing very sharp and quick surf carves and surf-style cutbacks. It’s also a good option for lighter skaters who generate less pressure on the adapter in tight turns. The S5 version of the Yow skateboard surf adapter uses a bigger and heavier 5mm spring in its core, with more resistance in sharp turns. It’s ideal for heavier riders or skaters who with more radical riding styles and power moves that call for more resistance. How do the Yow and Waterborne skateboard surf adapters compare? The main difference between them is that Waterborne uses a urethane bushing while Yow has a mechanical spring. As a result, the two adapters have a very different riding feel. Many riders feel the Waterborne has a quite fluid and natural feel close to ocean surfing. Also, riding in a straight line for transportation on the Waterborne is easier than on the Yow, which is relatively unstable and hard to push on over any distance. However, the Yow has a locking pin that lets you instantly turn your board back into a regular cruiser skateboard or longboard – with its associated stability. By activating the lock pin, you also make the Yow adapter better-suited for higher speed by eliminating the instability associated with the looseness. As mentioned earlier, the Waterborne’s is also relatively stable at higher speed when fitted with the complementary Rail Adapter in the back. The Yow surf skate adapter’s very loose steering and shortboard-like mobility is often compared to the Smoothstar surf skate system, which has the same geometry. Like the Waterborne, the Yow is generally considered closer to radical surfing than the Carver C7. The Yow is a good fit for performance shortboard simulation and cross-training. It also works well for radical surf-style skatepark and bow riding. The Yow skateboard surf adapter is available on Amazon US and UK: Yow S5 (US), Yow S5 (UK) or Yow S4 (UK). Both the Waterborne and Yow skateboard surf adapters are great products that let you turn your regular skateboard, longboard or cruiser into an agile and tight-carving surf skateboard without having to replace your favorite deck or trucks. The two adapters use different systems (bushing-based vs spring-based) and hence provide very different land surfing experiences. Which one you prefer depends on your personal preference and your mix of surf training, surf-style pumping, commuting, downhill, and park & pool riding.